If you haven't been to Bonnie Hunter's website, go there immediately! Can you believe that is freehand? And it was easy, too! Day 13 with no stove. No end in sight. This girl needs cake. So I made gluten free chocolate cake in the toaster oven. I had to eat a small piece to make sure it was ok, and it was absolutely delicious! The main ingredient is: garbanzo beans. I kid you not. This quilt lived on my design wall for many months last year, and I am so excited to finally quilt it! I thought I would film some of the steps of custom quilting to give you an idea of the process. After layering the backing, cotton batting, wool batting, and the top, I basted the edges of the quilt and began to stitch-in-the-ditch. On a longarm machine, this involves using a ruler and a ruler base. I chose to use the Handi Quilter Mini Scallop Ruler for the stitch-in-the-ditch because the ruler is a nice size (8x3 inches) and has little stoppers at each end. These stoppers help line the needle up with the ditch and also make sure that I won't quilt off the end of my ruler. I stabilized the entire quilt by stitching-in-the-ditch around each border and around the edge of the center block. Next week I can begin to add decorative quilting! I'm in the middle of a long and drawn out disagreement with my the company that carries the warranty on my stove. On the bright side, I have had eleven days to explore creative ways to cook with small kitchen appliances. (On the not so bright side, I may have many, many more days to continue this creativity). Vegetable lo mein in the electric skillet. I even boiled the noodles in that skillet! My friends have been following along, asking about the "small kitchen appliance of the day" and suggesting that I start a new blog. I do not have time for another blog, but I figured I could carve out time for one post about my cooking adventures. Tonight's "kitchen appliance of the day" was the toaster oven. I made deep dish pizza in an 8x8 pan. If this is something that you might like to make, here are the ingredients. Note: I don't really use recipes, so everything is approximate. Sorry. and, if you are lucky like I am, some fresh lamb sausage from the local farm. yum! Bake at 425*ish for 15 ish minutes. After about 15 years, it's finally happened: my son has claimed a quilt. Don't get me wrong, he has quilts. Technically, I finished it thirteen months after he got married, but in a long marriage, what difference do thirteen short months make? But this week, he actually claimed a quilt. He saw me binding (by hand!) a new sample of my Dream a Little Dream quilt pattern. "Mom," he asked, "how long does this quilt have to be a sample before it goes to it's rightful owner?" "Rightful owner? Like me?" I teased. "No. You made this for me. Isn't this Dream a Little Dream?" he asked with a huge smile. It's always the smiles that get me. And the fact that he knows my quilt patterns by name doesn't hurt either. It's warm and yummy and made from very masculine homespun fabrics. How long should I make him wait for it? It was a nice white border, just begging for some fun quilting! Vote here! Pick your favorite, or pick mine (#29)! For once, I am actually ahead of schedule. Matthew is graduating from high school in 2012. Yes, over a year away. His quilt top has been done for over a year, so I just decided to quilt it up on a recent snowy day. Which snowy day? I cannot remember -- there have been too many! In case you are experiencing deja vu, I have made several quilts like this. Let's hope Matthew finishes the 11th and 12th grades, and that I can find the quilt by the time he graduates! My husband is one of five cousins, all male. There are about fifteen years between the oldest and the youngest. My husband (and I) got married twenty-some years ago, and another cousin got married about ten years ago. The other three? They all got married in the last eight months. Aaron and Kristin were the last to marry and I finished their quilt in time for the wedding. I am as shocked as you are. There are five cousins in the next generation (so far). My son is already married. My daughter has the rest of college, grad-school and possibly a PhD before she'll think of marriage (she says). The other three cousins are all under seven years old. I think I have some time before this side of the family requires more wedding quilts. Maybe I can sneak a nap in somewhere? No, but there is something new about my blog. I've joined the Quilt Teacher Blog Ring. 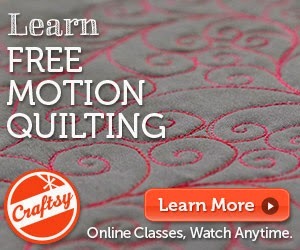 Since a lot of you are snowed in, grab a cup of tea and click on the link on my sidebar and check out the blogs of other quilt teachers! Patchwork Posse hosts a trunk show on Tuesdays, and today they showed mine! And remember, you still have a few hours to add your nomination for MQX Teacher of the Year. Let your voice be heard!